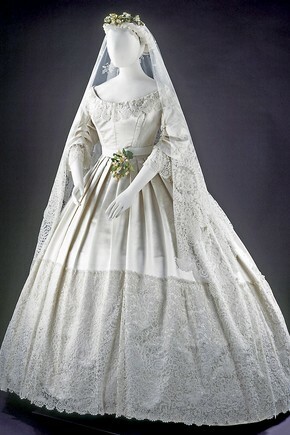 Its been great to receive so much positive feedback about Edwina Ehrman’s wonderful talk at Te Papa last week about Unveiled: 200 Years of Wedding Dress. From the comments we’ve received, it sounds like you are as excited as we are! Behind the scenes it was great to have Edwina here to take us through the exhibition and the complexities of the mounting and display. You’ll be pleased to know that we did an additional interview with Edwina about key garments that you will be able to down load from home or within the gallery come December. Just as in Edwina’s talk, the interview contains a lively mix of information about the designer and construction of the garments, the bride’s and groom’s story, along with delightful anecdotes and asides. If you can’t wait until December for another wedding dress ‘fix’, why not explore the V&A’s website? The V&A has a wonderful ‘behind the scenes’ page which includes a look at the conservation and preparation of this silk and Honiton lace wedding dress which is destined for Te Papa. Many of the garments included in Unveiled took at least 25 hours to prepare for display. This snippet will reveal why. If you are interested in undergarments and their powerful role in creating fashionable silhouettes you might like to also tune in the the V&A Channel and watch their film on undergarments featuring Eleri Lynn who has just published a book on the subject. And then there is the film on the Grace Kelly exhibition… as you can see it is easy to wile away a whole afternoon, but with the winter chill settling in its a great way to spend an hour or two.